JIGGING SPOONS. These lmes resemble spoons used for casting or trolling, but are genera11y thicker and flatter. Most are made oflead, chromed brass or stainless steel. Because jigging spoons have treble hooks, they hang up more often than jigs. But they unsnag easily, so they are idea1 for fishing in timber and brush. Long, thin jigging spoons are used mainly for verti-ca1 jigging, but a1so work for casting. Shorter, wider spoons, called slab spoons, resemble sma11 shad. Their compact shape makes them effective for distance casting to schools of gamefish pmsuingshad on or near the surface. VIBRATING BLADES. These lures have a lead head, a thin steel tail, and treble hooks at each end. A series of line-attachment holes enables you to change the balance and action. Vibrating blades can be used for vertica1 jigging, casting or trolling. TAILSPINS. The thick lead body has a wire at the rear that serves as a shaft for a spinner blade. Most tailspins have one treble hook attached to the bottom, but some have another treble behind the spinner blade. The attachment eye is at the top. Tailspins are excellent for vertical jigging and casting to surface-schooling fish. EGGING SPOONS flash and flutter enatically when allowed to sink on a slack line. They tip slightly from side to side when retrieved. But jigging spoons generally lack the typical wobbling action associated with most other types of spoons. VIBRATING BLADES wiggle rapidly when pulled through the water, but have no action as they sink. Attaching the line farther to the rear increases the wiggle. TAILSPINS have a spinner blade that tums when the lure is pulled forward and helicopters when the lure is allowed to sink. 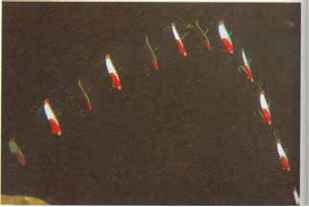 Tailspins lack the fluttering or wiggling action of other jigging lures, but the constant rotation of the blade provides more flash. When fish are buried in heavy cover or holding along vertical structure, no other lure works as well as a jigging spoon. Its density causes it to sink quickly, so you can lower it into tight spots where other lures would be difficult to present. You can jig a spoon vertically in a small opening in a stand of flooded timber, over a deep brush pile, or alongside a bridge piling or sheer cliff. Or, you can jig it vertically while drifting with the wind or current. You can also cast a jigging spoon and retrieve it along bottom, as you would a jig. A jigging spoon has an attractive fluttering action when it sinks. But if you keep the line too tight, the spoon will not flutter. As the spoon sinks, maintain less tension than you would with a jig. Jigging spoons are most effective when the water is cool or cold and fish hold tight to cover, refusing fast-moving lures. 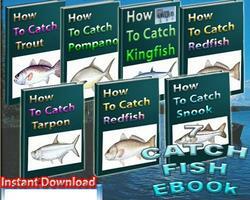 Under these conditions, you must work the lure slowly and present it within inches of the fish. A fish strikes a jigging spoon much the same way it strikes a jig. Set the hook at any tap, or if the line moves sideways or fails to drop as expected. Fishermen use spoons weighing from 1/8 to 1/4 ounce for crappies and white bass; 1/4 to 1 ounce for largemouth, smallmouth and spotted bass; and 1 to 21/2 ounces for lake trout and stripers. CAST a slab spoon to a surface school of white bass, stripers or largemouths. Circling gul1s often pinpoint a school. Start your retrieve as soon as the spoon hits the water, and hold your rod tip high to keep the lure from sinking. 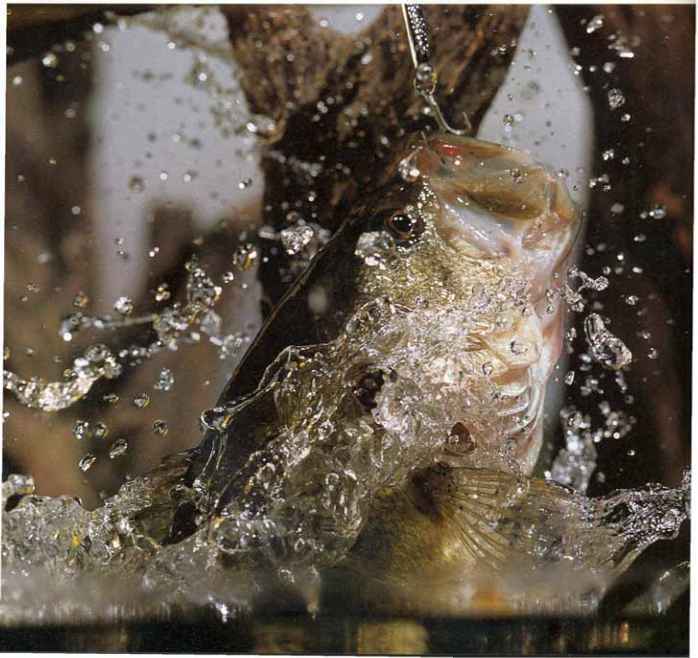 A rapid retrieve usually draws more strikes than a slow one. ATTACH a split ring to the eye using a split-ring pliers. Tying directly to the eye restricts the action, and the sharp edge will fray your line. JIG the spoon vertica11y as you drift over a school of suspended fish. 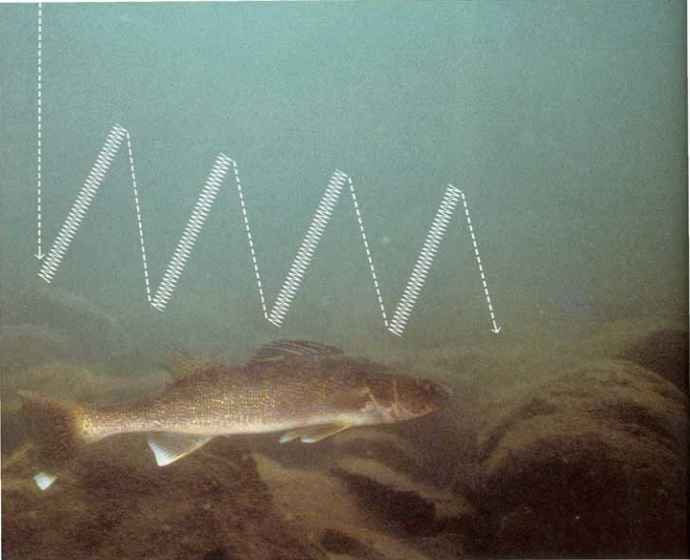 A graph recorder enables you to see the fish and the path of your spoon. Then, you can adjust your depth accordingly. 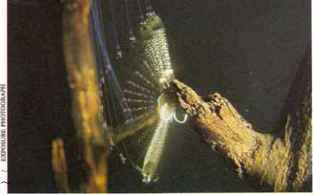 WORK a jigging spoon along the shady side of a standing tree or other vertical cover. Lower the spoon a few feet, then jig it at that depth for several seconds. Continue lowering and jigging until you reach bottom. BEND a jigging spoon togive it the best action for your type of fishing. A straight body or slight bend is adequate for vertical jigging. A more pronounced bend produces a wider wobble and works better for casting. 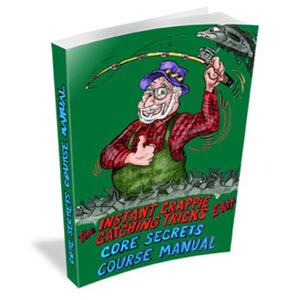 FREE a snagged spoon by raising your rod gently until the line is taut. Do not pull hard or the hook will sink in deeper. 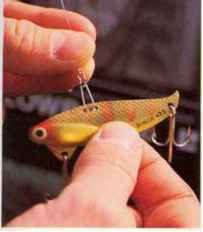 Drop the rod tip rapidly; the impact of the heavy spoon falling will usual1y dislodge the hook. 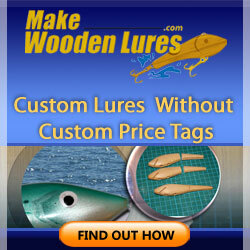 JIG a blade vertically by sweeping your rod upward to make the lure vibrate. 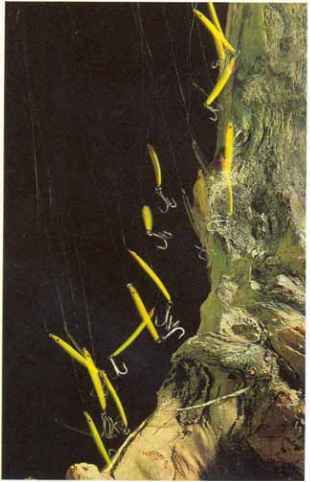 Experiment with sweeps ranging from 1 to 4 feet, always keeping the line taut while the lure sinks. Fish almost always strike on the drop. A vibrating blade attracts gamefish with its intense wiggling action. Because fish can detect vibrating blades with their lateral-line sense as well as with their sense of sight, the lures work well even in turbid water. 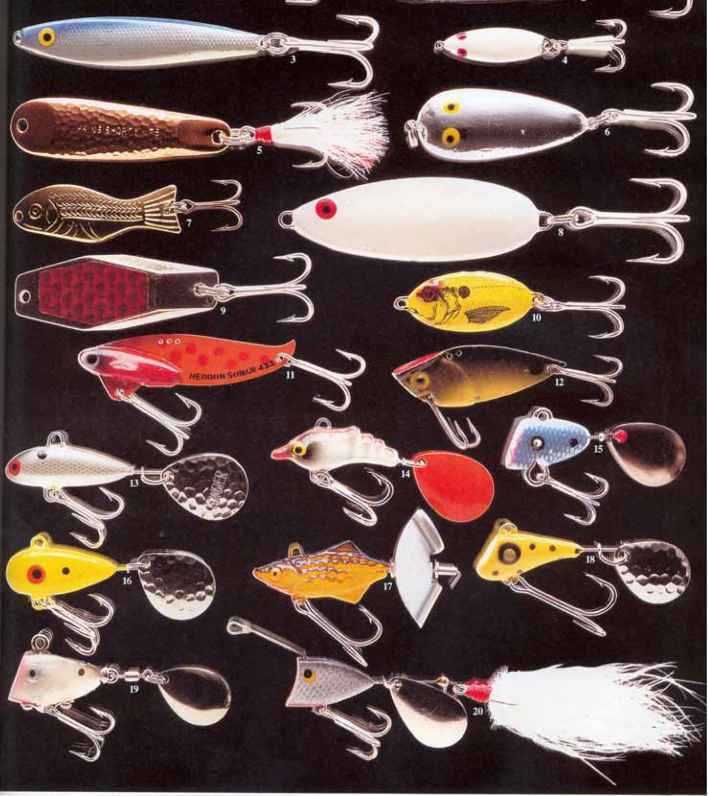 Fishermen use blades weighing from l/8 to l/4 ounce for white bass and crappies; from l/4 to l/2 ounce for walleyes, largemouths and smallmouths; and from l/2 to l ounce for stripers and lake trout. You can fish a vibrating blade by jigging vertically, casting or trolling. Vertical jigging generally works best over a fairly clean bottom. Because a blade lacks the density of a jigging spoon, it is not as easy to free should it BecoTe snagged. When casting or trolling with a vibrating blade, keep the lure moving steadily, much as you would with a crankbait. The fast sink rate of a blade enables you to reach deeper water than you could with most crankbaits. You can also hop a vibrating blade across bottom. The hopping retrieve is much like the bottom-bouncing technique described on page 95, but you must use longer upward sweeps to make the blade vibrate. 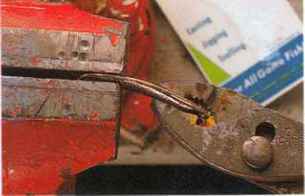 Vibrating blades have two or three holes along the back for attaching your line. How much the lure wiggles and the depth at which it runs depends on where you attach it. Experiment with different attachment holes to determine the one that works best for your fishing situation. .
CONNECT a bladewith a plain snap instead of a snap-swivel. 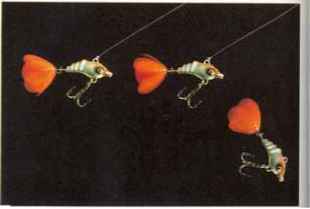 The hooks swing up when the lure sinks and Tay foul on a longer swivel. How to make a swing hook for jigs? How to make 1/4 oz slab spoon?